If You Want to Attract More Leads, More Clients and More Money To Your Business, Then Check Out My Business-Building Tools Designed to Boost Your Business...Guaranteed! Because we are right there in the trenches providing copywriting and marketing strategy to our clients, we're constantly seeing first-hand what works… and what doesn’t. And that's included in ALL our products and programs. 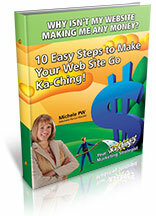 Why Isn't My Website Making Me Any Money?10 Easy Steps For Making Your Web Site Go Ka-Ching! Got a website and no sales? In 30 minutes or less you can quickly and easily pinpoint EXACTLY what's wrong with your site and what you need to do to transform it into a money-making machine! Click here to learn more. Finally! A simple, powerful, step–by–step method to transform your website into one you absolutely LOVE and that LOVES YOU BACK! You CAN learn exactly what it takes to build a website that is totally in alignment with your business, your mission, and your values. I’ll show you how – so you can reach more people, get your gifts out into the world in a bigger way AND start making more money! Click here to learn more. Your Internet Success Story: How To Get the Internet to Work for YOU! It Doesn´t Have to Be Like This! Ditch the Negativity, Beating Yourself Up, Frustration, Anxiety, Analysis/Paralysis and Anything Else That's Holding You Back From Becoming the Success You Know You Can Be! You're going to walk away with your very own INDIVIDUALIZED Internet Marketing Success Plan PLUS be ready to take ACTION and launch that plan IMMEDIATELY. Click here to learn more. 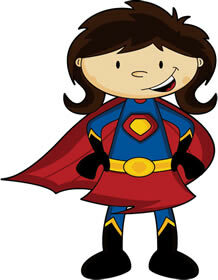 A rock star opt-in page is key to a successful online business. Does YOUR opt-in page have rock star quality? If not, then chances are you're not capitalizing on a massive opportunity to get your visitors to give you their contact information. 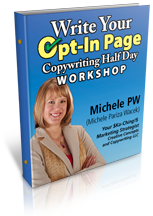 Because I believe in the power of the opt–in page, I’m offering a brand new program, the "Write Your Opt–In Page Copywriting Half Day Workshop." During our time together, you learn what’s working now and what isn’t when it comes to opt–in pages, plus a "secret formula" that regularly yields 50-80% conversion rates – and how to tweak the formula for your specific business, or to improve conversion rates. Get the details here. Books — Feel like curling up with your Kindle and getting some great ideas for growing your biz? Well today is your lucky day! (And the best part? You don’t even need a Kindle to immediately download and start enjoying.) Click here to learn more. Marketing or Copywriting Mentorship. This is perfect for you if you want business and marketing advice that’s working RIGHT NOW (as opposed to what used to work) so you can grow your business and make money NOW. Click here to learn more.